Oh man, I am so excited for today! So many of my favorite bloggers coming together& sharing amazing vegan food. What's better than that you ask? Getting to meet a whole slew of new to me bloggers through the potluck- so awesome. A huge thank you to Annie, Somer and Jason for all your hard work organizing the potluck - you all amazing! I knew immediately what I wanted to contribute to the potluck - this recipe was in my pre vegan binder of tried and true recipes. 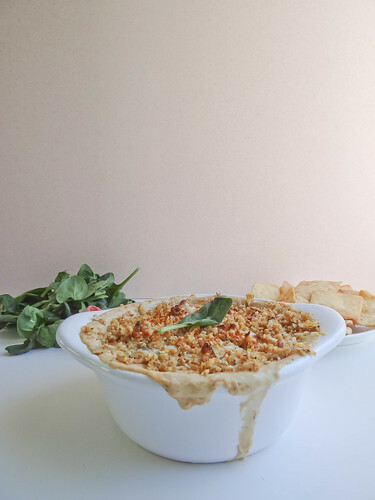 This dip has been made for Superbowl Parties, Birthday's, Celebrations & Neighborhood Dinners and has never let me down -always a crowd pleaser. 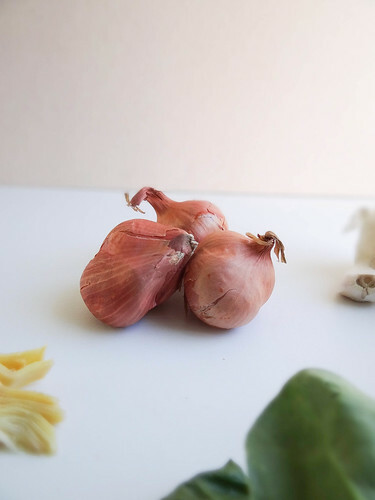 The ingredients are easy to come by - it is a dip that you can pull together at a moments notice or make ahead of time and reheat when the party starts. I have made this on the stove top, in the oven and in a crock pot - all versions are good, however I really love the baked version. 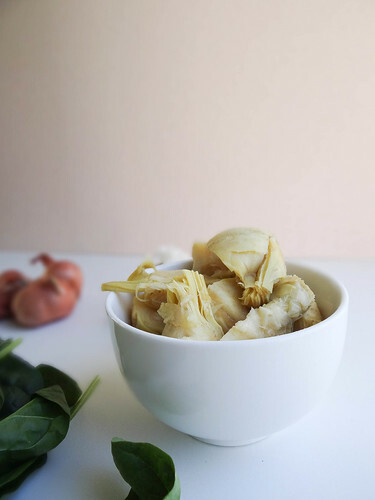 Not a fan of artichokes? 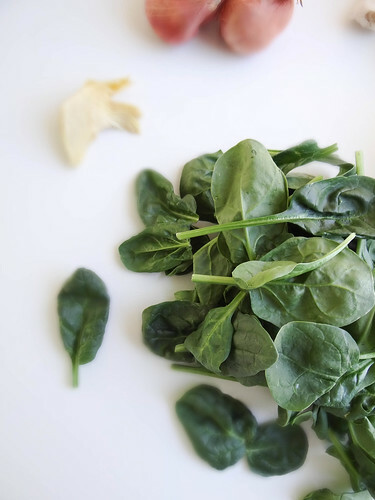 Leave em' out and add in a few additional cups of spinach. No vegan Worcestershire on hand? No worries, you can leave it out and it will still be amazing. I like dips that travel well and this one does - simply reheat upon arrival. To make transporting & heating even easier make it in your crock pot - this is especially a good option if you are going to potluck. You can top the dip with daiya, almanese or both. I like the combination of the two, make sure you add the almanese during the last 10 minutes of baking to prevent burning. 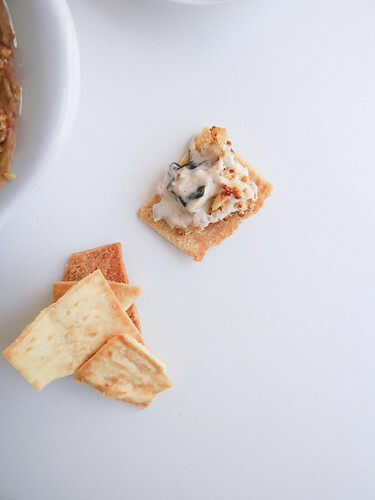 I like to serve this dip with crostini, pita chips, bagel chips & fresh veggies - if you can find sesame sticks that would be a pretty awesome dipper too! Do you have a favorite go to party dip? What are your favorite celebrations to attend- personally, I love Cinco de Mayo and any excuse to have a VBBQ I am there! In a dutch oven heat oil over medium heat, Add Shallots and Garlic, saute until fragrant and golden brown. Working in batches add spinach and allow to wilt. Transfer spinach mixture to a fine mesh sieve, drain pressing to release excess liquid. Set aside. In the same pan, warm milk over high heat. Add vegan cream cheese and whisk until smooth. Add drained & chopped artichokes, spinach, hot sauce, Worcestershire sauce and 1/2 cup of shredded vegan cheese. Stir to combine. Transfer mixture to a baking dish - place baking dish on a rimmed baking sheet and bake for 20 minutes or until hot and bubbly. At the half way point (at the 10 minute mark) top dip with the additional 1/4 cup of vegan cheese and almanese. Remove from oven and allow to cool a bit prior to serving. Serve with fresh (sturdy) veggies, pita chips, crostini, sesame sticks. This looks wonderful. Super comfort food. I love how versatile it is. Mmmm, I love vegan dips...especially spinach and artichoke dips. I will definitely have to try making this one soon! Oh yeah, I can totally get down with that creamy dreaminess. this looks like one perfect addition to take around to any potluck! creamy dreaminess indeed! 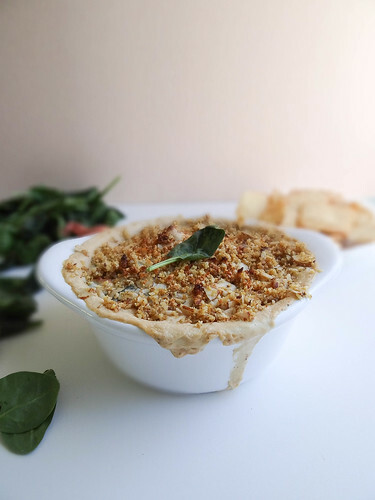 A grand & very tasty looking vegan dip! A must make! I am happy to find your lovely blog over here in the VVP! MMMMMMMMMMMMMMMM! I also joined in the dessert section! Many greets from a foodie from Belgium! Spinach dip always has a welcome place on my plate. Looks delicious! Oooooh! I wanna get some flat breads at this dip ASAP!!! I need to make this! Happy VVP! Delicious, one thing I've missed as a vegan! 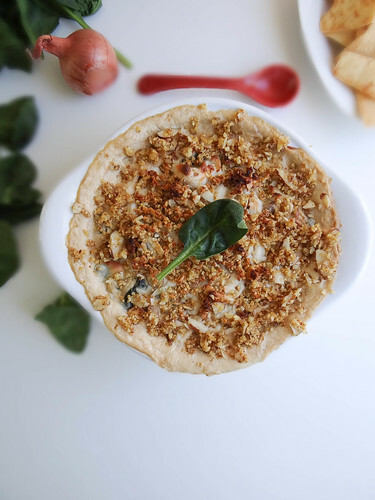 I love spinach and artichoke dip, but haven't eaten it since I've gone vegan (7 years now - yikes!). I have to try this soon. Oh now THIS looks simply divine!! Yummy! What would a potluck be without the artichoke dip! Although it is rarely vegan. This just feels so perfect. Delicious!! I can seriously eat that everyday! A classic!! I loved this as a kid. It looks just as ooey-gooey good (better! ), too! Thanks so much for participating! My mouth is watering! I can't wait to whip this dish up. Yum. I think you could fool even the most Ominvorous party-goers! 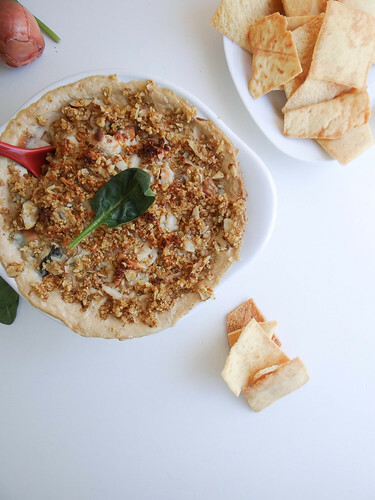 Spinach and Artichoke dip is my very favorite party dip! 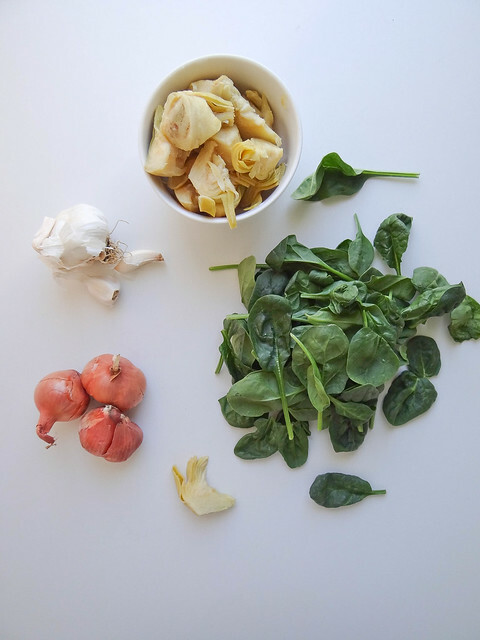 Spinach and artichoke dip is one of my very favorites--I've been known to make a dish and just eat it for dinner with half a baguette. :) Your version sounds amazing! Hmmmm, this dip looks so yummy. I can just imagine making a batch that is supposed to serve 8-10 (bwhahaha) and just eating it all by rolling it up in red cabbage leaves (one of my favourite vehicles to get dip into my mouth). Thank you for the great recipe. One of my favorite dips ever! Looks delish! I have been dyingggg to find a good spinach artichoke dip without the cheese. This one looks amazing! This looks great. 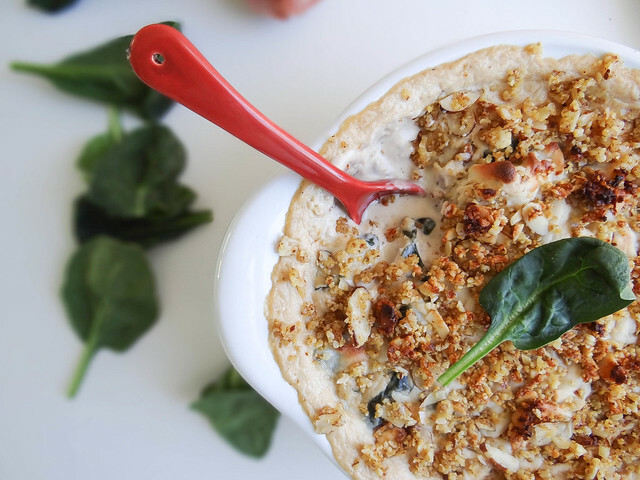 I used to love spinach artichoke dip once upon a time, but now I can love it again! Dips are quintisenntial to a potluck and this would be welome at any. Great addition! Oh man, this is totally one of my favorite dips! Totally bringing this to one of my next gatherings. yummy! i only had spinach artichoke dip once and i was in love! this looks so creamy and delicious! must try! Oh girl, this looks so good! 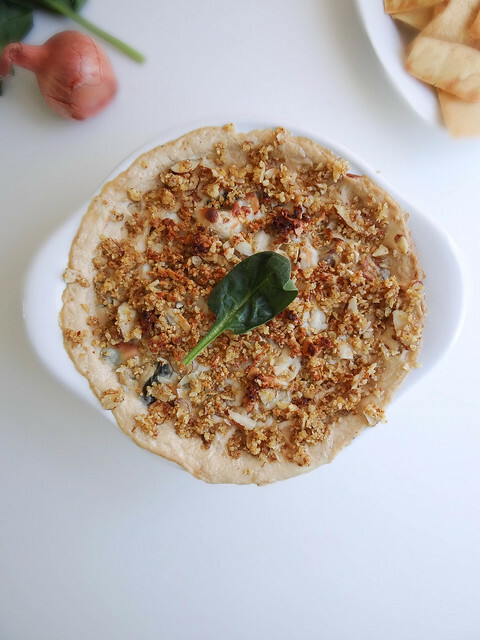 Almanese is like a vegan Parmesan made from sliced almonds, nutritional yeast, garlic, olive oil & lemon juice- it is really easy to make- veganmonicon has a great recipe in their cookbook! Holy cow that looks SO GOOD!! I'm a sucker for spin & art dip! 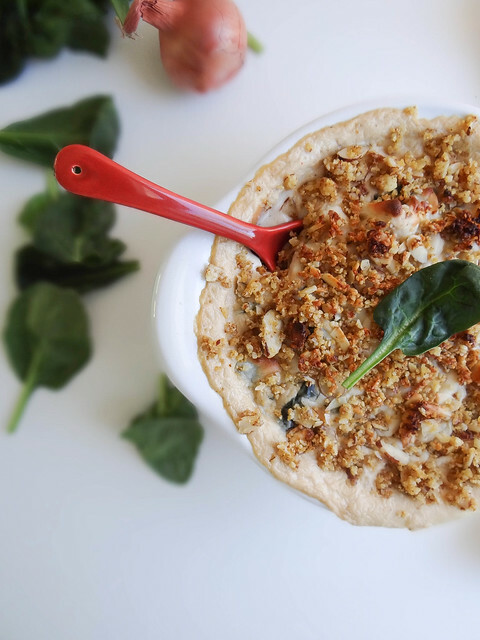 I love that you made a healthier vegan version of spinach and artichoke dip! I usually find them overloaded with oil and cheese and just way too rich to eat more than a little bit, but I've never tried a vegan version - I'm sure I would have a harder time eating only a little bit of your dip! I like the browned bits on top too - did you add a crumble or nuts on top (it looks like almonds)? Thanks Genevieve! I made an almanese with slice almonds, nooch, olive oil, lemon, garlic & a little salt- so good! I never made this dip, but this friend of mine made it a couple of time for potluck parties and it's always licked clean. Love it! Finally got a chance to sit down and go through the potluck! Looks really yummy, I have never had a hot dip before but as it's becoming wintery here I think I might have to try it - bookmarked! 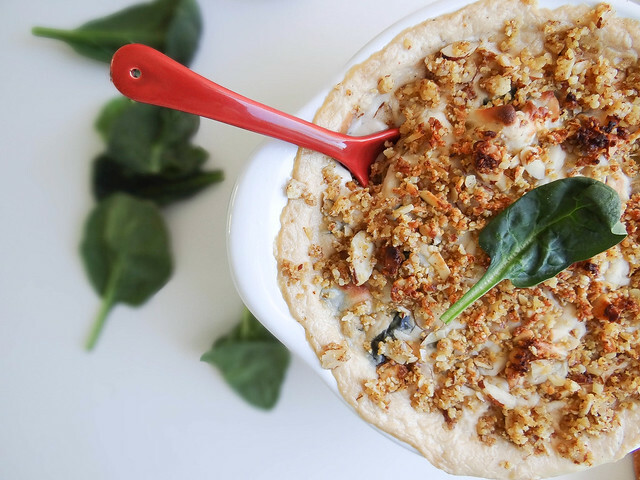 I love spinach + artichoke dip and yours looks amazing! Thanks for sharing.